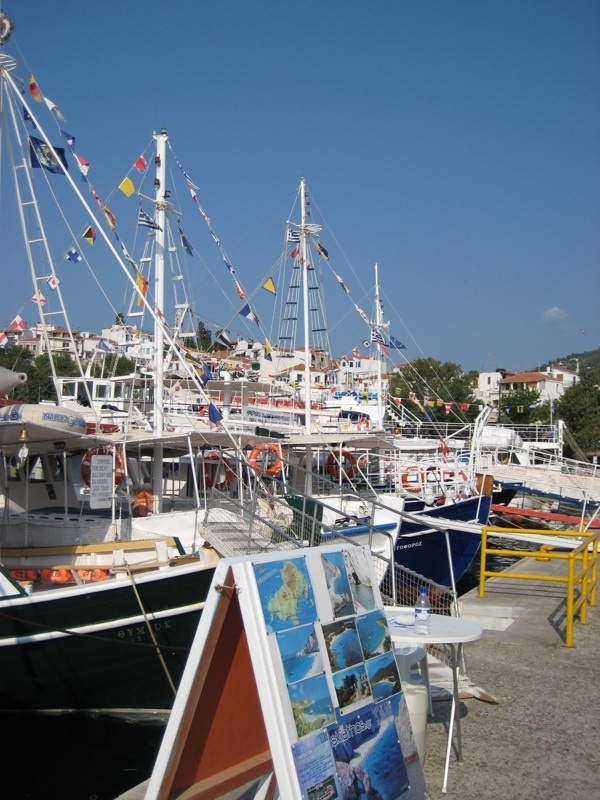 Visit Skiathos Greece Getting Around. Skiathos Town. Each of these outlets offer a range of vehicles to suit all budgets and requirements. Vehicle hire is reasonable in Skiathos, though it may be advisable to shop around, particularly in high season. A full driving license is required to hire a vehicle in Greece. You may also be required to present your passport at the time of hire. The main road on Skiathos goes from Skiathos Town to Koukounaries in the south west of the island via a tour all of the resorts and hamlets along the south coast. This is one of the few fully metalled roads to be found outside of Skiathos Town, with most of the island's interior roads being nothing more than gravel or dirt tracks. Check with your hire company for details of which roads you are permitted to take your hire vehicle on as many insurance policies will not cover you to drive on anything other than a fully metalled surface. Also, make sure that the insurance is full cover. As the influx of tourists during the peak season can swell the island's population exponentially, the roads can become severely congested. This is especially a problem in Skiathos Town where finding car parking spaces can become a real challenge. There is a daily bus service that operates a route along the main road from Skiathos Town to Koukounaries every twenty minutes through the day during peak season. The busses are particularly busy at the end of the day when they are filled with tourists making the return trip from Koukounaries Beach. There are several taxi operators on Skiathos. Most are based in Skiathos Town and will gladly take you to where ever you want to go on the island. Normally, the taxi driver will be happy to meet you at an agreed place and time for your return journey. The drivers are very personable and will be pleased for you to have their business card in the hope that you will utilise their services throughout your stay on the island. It is worth noting that whilst the taxi fares on the island are regulated, drivers will increase the tariff if your journey involves straying from the main road. There are many places from which a small boat can be hired to explore the coastline of Skiathos. Principally these are located in Skiathos Town. Instruction is available for those who would like to learn the basics of boatcraft before setting off. Alternatively, you can board one of the daily boat trips that sail from Skiathos Town and sail around to the otherwise inaccessible beaches that can be found on the north of the island. See the Skiathos Sailing page for full details of boating, cruising and yachting around Skiathos.